Cleveland’s Corey Kluber won his second Cy Young Award in 2017 with 18 wins and a 2.25 ERA. March 29 at Seattle, 10:10 p.m.
March 31 at Seattle, 4:10 p.m.
April 1 at Seattle, 4:10 p.m.
April 2 at L.A. Angels, 10:07 p.m.
April 3 at L.A. Angels, 10:07 p.m.
April 4 at L.A. Angels, 4:07 p.m.
April 6 Kansas City, 4:10 p.m.
April 7 Kansas City, 4:10 p.m.
April 8 Kansas City, 1:10 p.m.
April 9 Detroit, 6:10 p.m.
April 10 Detroit, 6:10 p.m.
April 11 Detroit, 6:10 p.m.
April 12 Detroit, 6:10 p.m.
April 13 Toronto, 7:10 p.m.
April 14 Toronto, 4:10 p.m.
April 15 Toronto, 1:10 p.m.
April 17 at Minnesota, 7:10 p.m.
April 18 at Minnesota, 7:10 p.m.
April 20 at Baltimore, 7:05 p.m.
April 21 at Baltimore, 4:05 p.m.
April 22 at Baltimore, 1:05 p.m.
April 23 at Baltimore, 7:05 p.m.
April 24 Chicago Cubs, 6:10 p.m.
April 25 Chicago Cubs, 7:10 p.m.
April 26 Seattle, 6:10 p.m.
April 27 Seattle, 7:10 p.m.
April 28 Seattle, 4:10 p.m.
April 29 Seattle, 1:10 p.m.
April 30 Texas, 6:10 p.m.
May 1 Texas, 6:10 p.m.
May 2 Texas, 1:10 p.m.
May 4 at N.Y. Yankees, 7:05 p.m.
May 5 at N.Y. Yankees, 1:05 p.m.
May 6 at N.Y. Yankees, 1:05 p.m.
May 8 at Milwaukee, 7:40 p.m.
May 9 at Milwaukee, 1:10 p.m.
May 11 Kansas City, 7:10 p.m.
May 12 Kansas City, 4:10 p.m.
May 13 Kansas City, 1:10 p.m.
May 14 at Detroit, 7:10 p.m.
May 15 at Detroit, 7:10 p.m.
May 16 at Detroit, 1:10 p.m.
May 18 at Houston, 8:10 p.m.
May 19 at Houston, 4:10 p.m.
May 20 at Houston, 8:05 p.m.
May 22 at Chicago Cubs, 7:05 p.m.
May 23 at Chicago Cubs, 8:05 p.m.
May 24 Houston, 6:10 p.m.
May 25 Houston, 7:10 p.m.
May 26 Houston, 7:15 p.m.
May 27 Houston, 1:10 p.m.
May 28 Chicago White Sox, 4:10 p.m.
May 29 Chicago White Sox, 6:10 p.m.
May 30 Chicago White Sox, 1:10 p.m.
May 31 at Minnesota, 8:10 p.m.
June 1 at Minnesota, 8:10 p.m.
June 2 at Minnesota, 2:10 p.m.
June 3 at Minnesota, 2:10 p.m.
June 5 Milwaukee, 7:10 p.m.
June 6 Milwaukee, 1:10 p.m.
June 8 at Detroit, 7:10 p.m.
June 9 at Detroit, 4:10 p.m.
June 10 at Detroit, 1:10 p.m.
June 13 at Chicago White Sox, 8:10 p.m.
June 14 at Chicago White Sox, 2:10 p.m.
June 15 Minnesota, 7:10 p.m.
June 16 Minnesota, 4:10 p.m.
June 17 Minnesota, 1:10 p.m.
June 18 Chicago White Sox, 7:10 p.m.
June 19 Chicago White Sox, 7:10 p.m.
June 20 Chicago White Sox, 1:10 p.m.
June 22 Detroit, 7:10 p.m.
June 23 Detroit, 6:10 p.m.
June 24 Detroit, 1:10 p.m.
June 25 at St. Louis, 8:15 p.m.
June 26 at St. Louis, 8:15 p.m.
June 27 at St. Louis, 8:15 p.m.
June 29 at Oakland, 10:05 p.m.
June 30 at Oakland, 4:05 p.m.
July 1 at Oakland, 4:05 p.m.
July 4 at Kansas City, 8:15 p.m.
July 6 Oakland, 7:10 p.m.
July 7 Oakland, 4:10 p.m.
July 8 Oakland, 1:10 p.m.
July 9 Cincinnati, 7:10 p.m.
July 10 Cincinnati, 7:10 p.m.
July 11 Cincinnati, 7:10 p.m.
July 12 N.Y. Yankees, 7:10 p.m.
July 13 N.Y. Yankees, 7:10 p.m.
July 14 N.Y. Yankees, 7:15 p.m.
July 15 N.Y. Yankees, 1:10 p.m.
July 20 at Texas, 8:05 p.m.
July 21 at Texas, 8:05 p.m.
July 22 at Texas, 3:05 p.m.
July 23 Pittsburgh, 7:10 p.m.
July 24 Pittsburgh, 7:10 p.m.
July 25 Pittsburgh, 1:10 p.m.
July 27 at Detroit, 7:10 p.m.
July 28 at Detroit, 6:10 p.m.
July 29 at Detroit, 1:10 p.m.
July 30 at Minnesota, 8:10 p.m.
July 31 at Minnesota, 8:10 p.m.
Aug. 1 at Minnesota, 1:10 p.m.
Aug. 4 L.A. Angels, 7:10 p.m.
Aug. 5 L.A. Angels, 1:10 p.m.
Aug. 6 Minnesota, 7:10 p.m.
Aug. 7 Minnesota, 7:10 p.m.
Aug. 8 Minnesota, 7:10 p.m.
Aug. 9 Minnesota, 1:10 p.m.
Aug. 10 at Chicago White Sox, 8:10 p.m.
Aug. 11 at Chicago White Sox, 7:10 p.m.
Aug. 12 at Chicago White Sox, 2:10 p.m.
Aug. 13 at Cincinnati, 7:10 p.m.
Aug. 14 at Cincinnati, 7:10 p.m.
Aug. 15 at Cincinnati, 7:10 p.m.
Aug. 17 Baltimore, 7:10 p.m.
Aug. 18 Baltimore, 4:05 p.m.
Aug. 19 Baltimore, 1:10 p.m.
Aug. 22 at Boston, 7:10 p.m.
Aug. 23 at Boston, 1:05 p.m.
Aug. 24 at Kansas City, 8:15 p.m.
Aug. 25 at Kansas City, 7:15 p.m.
Aug. 26 at Kansas City, 2:15 p.m.
Aug. 28 Minnesota, 7:10 p.m.
Aug. 29 Minnesota, 7:10 p.m.
Aug. 30 Minnesota, 1:10 p.m.
Aug. 31 Tampa Bay, 7:10 p.m.
Sept. 1 Tampa Bay, 7:10 p.m.
Sept. 2 Tampa Bay, 4:10 p.m.
Sept. 3 Kansas City, 4:10 p.m.
Sept. 4 Kansas City, 7:10 p.m.
Sept. 5 Kansas City, 1:10 p.m.
Sept. 6 at Toronto, 7:07 p.m.
Sept. 7 at Toronto, 7:07 p.m.
Sept. 8 at Toronto, 4:07 p.m.
Sept. 9 at Toronto, 1:07 p.m.
Sept. 10 at Tampa Bay, 7:10 p.m.
Sept. 12 at Tampa Bay, 1:10 p.m.
Sept. 14 Detroit, 7:10 p.m.
Sept. 15 Detroit, 1:05 p.m.
Sept. 16 Detroit, 1:10 p.m.
Sept. 18 Chicago White Sox, 7:10 p.m.
Sept. 19 Chicago White Sox, 7:10 p.m.
Sept. 20 Chicago White Sox, 7:10 p.m.
Sept. 21 Boston, 7:10 p.m.
Sept. 22 Boston, 7:10 p.m.
Sept. 23 Boston, 1:10 p.m.
Sept. 27 at Kansas City, 8:15 p.m.
Sept. 28 at Kansas City, 8:15 p.m.
Sept. 29 at Kansas City, 7:15 p.m.
Sept. 30 at Kansas City, 3:15 p.m.
CLEVELAND – Chief Wahoo has been kicked to the curb for 2019. So Indians’ fans hope the club gives the smiling mascot a sendoff to remember this year. The Indians steamrolled their way to winning 102 games and cruised to the Central Division title by 17 games. But in the Division Series against the Yankees, the Indians held a 2-0 lead before losing three straight and the series 3-2. Outside of losing free agents Carlos Santana and Jay Bruce, the Indians have the bulk of the team returning. Last year the Indians led the league in ERA (3.30), fielding percentage (.987) and were second in batting (.263). They were also second in on-base percentage (.339). You can’t run on Roberto Perez, as he threw out 43 percent (13 of 30) of those who tried. He hit .208 with 12 doubles and eight home runs. His on-base percentage was .291. Yan Gomes has plenty of pop with 14 home runs and 15 doubles. He hit .232 with a .309 on-base. Gomes threw out 42 percent (24 of 57) of runners. Gone is Carlos Santana (.259, .363 OB, 23 HR, 79 RBI), who signed as a free agent with the Phillies. Taking over at first is Yonder Alonso, who finally reached his power potential last year in stops in Oakland and Seattle. He’s a former first-round pick by the Reds in 2008. Alonso never hit more than nine home runs before last year. But between the A’s and the Mariners he combined for 28, while hitting .266 (on base .365). It was a tough year for Jason Kipnis, who started last year on the disabled list with a right rotator cuff injury. He returned in late April, but was back on the disabled list in July with a severe hamstring injury. He came back, but landed on the DL for the third time when the hamstring gave out in August. Kipnis managed only 336 at-bats in 90 games and hit only .232 (.291 on base). The Indians hope he returns to his 2016 numbers: .275, 25 home runs, .343 on-base. Francisco Lindor is only 24, but ranks as one of the best overall players in baseball. Consider he has been to the last two All-Star Games and won the Gold Glove in 2016. Last year he hit .273 (.337 on-base) with career highs for doubles (44) and home runs (33). He also stole 15 bases and finished fifth in the MVP voting. In three seasons, his career batting average is .293. He’s capable of winning the Gold Glove every year. He had only 10 errors last year with a .984 fielding percentage. He ranked among the league leaders in assists (391) and double plays (111). Jose Ramirez packs plenty of pop in his 5-foot-9 frame. Last year he led the league with 56 doubles, along with reaching a career high with 29 home runs. In fact, he has 102 doubles over the last two years. He ranked third in the league in hitting at .318, with an on-base of .374. He ranked second in the league in total bases (341) and was fourth in runs scored with 107. He ended up third in the MVP voting. Defensively, he’s solid with only 12 errors between second and third. If left fielder Michael Brantley can’t make Opening Day, he’s expected to return to the lineup soon. Coming off ankle surgery in October, his first major league exhibition game was last Wednesday. Brantley missed almost all of 2016 with shoulder and biceps surgeries. He was limited to 338 at-bats last year. He hit .299 with nine home runs and had 20 doubles. Brantley is a career .292 hitter and a two-time All-Star. He just needs to avoid any more trips to the disabled list. Center fielder Bradley Zimmer was the Indians’ first-round draft choice in 2014 out of the University of San Francisco. He made his major league debut in May and hit .241 with 15 doubles and eight home runs. He stole 18 bases. He also had eight assists. Jay Bruce signed with the Mets. That gives Lonnie Chisenhall the inside path to right field. He hit .288 (.360 on base) with 12 home runs in 236 at-bats last year. There’s also former Indian Rajai Davis, 37, who hit .235 with 29 stolen bases between Oakland and Boston last year. Edwin Encarnacion did what he does best and that’s bash the ball. He hit 38 home runs, drove in 107 and had an on-base of .377 (.258 average). He was second in the A.L. in walks (104) and had 279 total bases. The 2017 Cy Young Award winner Corey Kluber has won two Cy Young Awards and was dominate last year. He led the league with 18 wins and a 2.25 ERA. He struck out 265 (second in the A.L.) and walked only 36 in 203 innings. He had five complete games and three shutouts. Opponents hit .193 off him. In the second half, he went 11-1 with a 1.79. Right-handers hit .186 off him for the year, while lefties hit .200. Carlos Carrasco also won 18, with a 3.29 ERA. He struck out 226 in 200 innings. Trevor Bauer won 17 with a 4.19. He struck out 196 in 176 innings. Josh Tomlin won 10 with a 4.98, but is a master of pinpoint control. He walked only 14 in 141 innings. Right-hander Danny Salazar (5-6, 4.28) has inflammation in his right shoulder. Mike Clevinger (12-6, 3.11) would fill Salazar’s spot if Salazar goes on the disabled list. Over the last four years closer Cody Allen ranks third in the A.L. in saves with 120. Last year he had 30 saves with a 2.94 ERA. He appeared in 69 games and had 92 strikeouts in 67 innings. One of the top set-up men in baseball is the versatile lefty Andrew Miller. He posted a 1.44 ERA over 57 games in 63 innings. He struck out 95 and opponents hit a mere .144 off him. Bryan Shaw (to the Rockies) and Joe Smith (to the Astros) both left via free agency. Others in the mix are Dan Otero (2.85 ERA), Nick Goody (2.80), Zach McAllister (2.65) and Tyler Olson (0.00 in 20 IP). The Indians will be expected to make a deep run in the playoffs and could reach the World Series. The team is one slugging outfielder away from a World Series championship team and could acquire that by the trading deadline. The starting rotation and bullpen both ranked No. 1 in the A.L. and should carry the team into the playoffs. 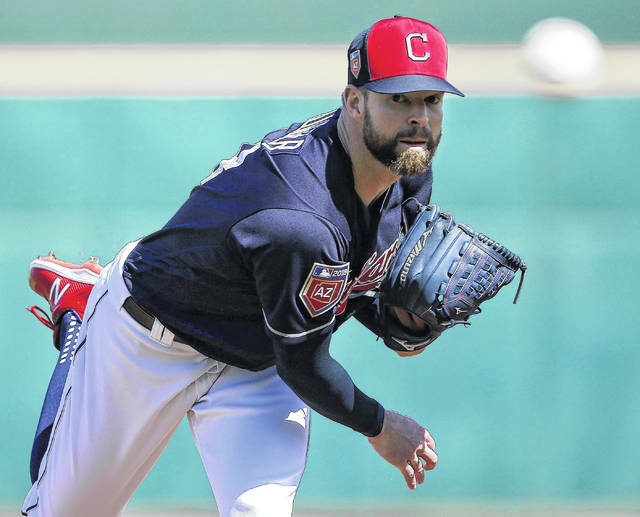 https://www.limaohio.com/wp-content/uploads/sites/54/2018/03/web1_03.24.18.kluber.jpgCleveland’s Corey Kluber won his second Cy Young Award in 2017 with 18 wins and a 2.25 ERA.